Last week’s revelations that a Chinese spy served on the staff of Sen. Dianne Feinstein (D-Calif.) for almost 20 years, should be shocking no one. At the time the spy was discovered by the FBI, Feinstein was chairwoman of the Senate intelligence committee. Feinstein says she forced the agent into retirement, but no other staff were informed of the circumstances behind his exit, and no charges were filed. “[Feinstein] said that while ‘the information was vague and nonspecific,’ she had concluded that she should ‘be very cautious’ in dealing with Asian-American contributors,” the NY Times report stated. 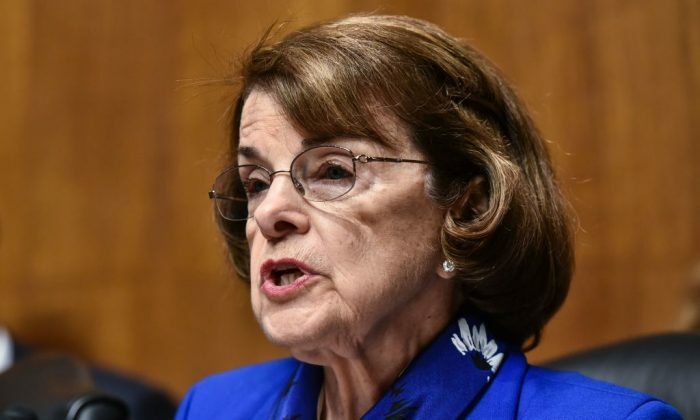 She might also be the target of “influence operations”—a subtler approach, by which Chinese operatives would try to steer Feinstein into promoting policies that might benefit the Chinese regime. Feinstein’s conciliatory approach to communist governments began in the mid-1950s, when she served in the Stanford University student government. In January 1955, a vigorous debate erupted on the Stanford student executive, over whether to support a proposed visit of seven Soviet journalists to the United States. The ayes won, and Goldman went on to personally host the delegation from the Soviet Writers Union when they toured Stanford’s campus later that year. Thirty years later, while serving as mayor of San Francisco, Feinstein issued an official city proclamation in support of that year’s World Festival of Youth and Students, held in Moscow. At the time, Feinstein’s colleague, Rep. Nancy Pelosi (D-Calif.) expressed grave concerns about the deal. Correction: A previous version of this article misstated who led Dianne Feinstein’s student trip to Europe. The trip was led by Stanford political science professor, James T. Watkins. The Epoch Times regrets the error.